Mercer Island's North End sits in the middle of Lake Washington, linked to both Bellevue to the east and Seattle to the west by the I-90 floating bridge. The coveted North End includes the neighborhoods of East Seattle, Mercerdale, and First Hill, with smaller waterfront neighborhoods lining North Mercer Way, from Faben Point to Fruitland. North End waterfront real estate is ideal for those who want to enjoy a luxurious lifestyle on the water while being close to shopping, dining and other services, with the area hosting the island’s retail district. Residents here will also be close to the most popular watering hole on the island, the historic Roanoke Inn, as well as the VFW Hall, which hosts a variety of events throughout the year. Owning North End waterfront real estate means being in the hub of the island’s community gathering activities too, including the Sunday farmer’s market held each year during the summer on 77 th Avenue SE. Just south of the town center, the annual Concerts in the Park series and the Summer Celebration festival is hosted at Mercerdale Park, and the community and event center, located just above Luther Burbank Park with its spectacular views and public docks, offers a variety of classes and programs for community members of all ages. Residents here may even have the best seat around for watching the annual Blue Angels performance – though Aubrey Davis Park in the North End is considered one of the top spots as well. North End waterfront real estate includes some of the most impressive homes, and views, in the entire country. If you’re looking to live the good life on the water while being close to major employers, a wealth of cultural attractions and just about anything else your heart desires, you’re unlikely to find better. 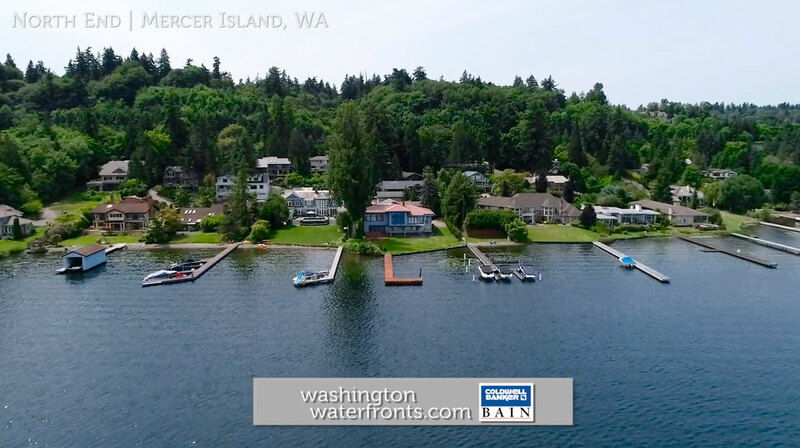 Look forward to coming home and standing in awe at the striking natural beauty of the lake and mountain vistas enjoyed from North End, Mercer Island. Take advantage of our industry-leading tools to make your property search as easy as possible and be sure to register for a FREE account so that you can receive email alerts whenever new North End real estate for sale hits the market. If you’re seeking to sell your North End property, contact our Waterfront Specialists directly for a comprehensive listing analysis and to learn more about the cutting-edge marketing strategies we’ll use to sell your home quickly for top dollar!